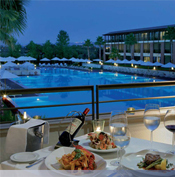 Hotel Nikopolis Thessaloniki is a De Lux 5 star Boutique City Resort, built in an area of 25.000 sqm. The Hotel is situated 3 km from “Makedonia” airport and 20 minutes from Thessaloniki’s city center and 45 minutes by car from the best beaches of Chalkidiki. It’s location within short walking distance to shopping centers, at the heart of a wide and continuously growing district of commercial activity, positions the Hotel as a destination for the business travelers. 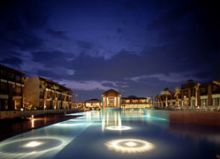 The modern design of 99 luxurious rooms and suites, decorated with unique pieces of furniture and lights that carry the signature of the most well known contemporary designers of the world. All rooms offer spectacular view at the pool or at the gardens, marble bathroom with separate shower and bathtub, LCD Flat Screen TV with satellite connection and Pay TV, individually controlled air-conditioning, soundproof windows, work desk, wireless and cable connection to the Internet, personal electronic safe box and mini bar. Hotel Nikopolis Thessaloniki accommodates high-level professional business meetings, conferences, seminars and social events for up to 1.000 people. Complete ultramodern audiovisual equipment is available to all rooms and can be tailor made according to the needs of any event. The contemporary architecture of the glass surrounded room The Atrium (465 sqm) with the natural light and the view to the impressive outdoor pool and the gardens, makes the perfect room for conferences, private parties and wedding receptions up to 600 persons. 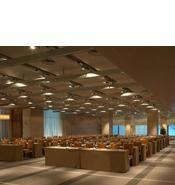 The Ballroom (415 sqm) is an absolutely modern conference room. The view to the outdoor pool waterfall, the design and the complete ultramodern audiovisual equipment, have established the room as one of the most hospitable places in town. In addition, the meetings rooms Alpha (100 sqm), Omega (100 sqm) and Kappa (40 sqm) all with natural light, can serve the needs of meetings, demonstrations and seminars.